Before we get started though, don’t forget to congratulate PHIT Sketch House Team, Dog Mountain who have been accepted into the 2016 North Carolina Comedy Arts Festival! South Street Magic – 617 E. Passyunk Ave.
Viscosity Theatre is a Philadelphia performance company dedicated to wildly physical, collaborateive and immersive experiences for audiences and artists. 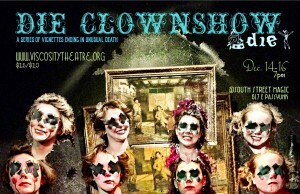 Which is why we can’t wait for DIE CLOWNSHOW (die), a series of comedic vignettes (i.e. sketches) that promises both clowns and an unusual death to end every scene. If you are afraid of clowns, perhaps you can tell yourself the old Mystery Science Theater 3000 mantra that it’s just a show and you should really just relax. Why? Because as Viscosity Theatre reminds, life is short, death is inevitable and these clowns, Rebecca Shaffer (Director of Viscosity Theatre), Rebecca Buckley, Hannah Van Sciver and Jessica Snow (Artistic Director at PHIT), are only here to present a multitude of possibilities to accompany that inevitability. 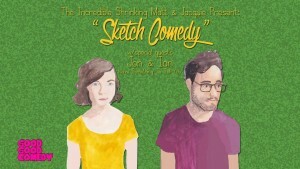 Good Good Comedy is bringing together two Philadelphia sketch duos for a run of new material entitled, ‘Sketch Comedy’; best friends Matthew Schmid & Jacquie Baker of The Incredible Shrinking Matt & Jacquie along with Temple Smash writer/performers Jon Plester & Ian Fletcher of Jon & Ian Have Something To Tell You. While the shows promise new material from both groups, there will also be a special midnight show at Vox Populi on Friday featuring a ‘Best Of…’ set from Matt & Jacquie. Poster art by Ben Jones Art. Beth Eisenberg (The Flannel Chucks / The N Crowd!) and Gina Gennari (Wussy Riot) have had a terrible 2015. It’s true, both of them have been through it and back and then subsequently through it again because like we just noted, they went back after going through it the first time. But don’t be too sad, because they’ve found catharsis by writing a monologue sketch show that will eulogize 2015 and then sufficiently burn it down to the ground. Featuring performances from Ralph Andracchio, Sarah Clemency, Karen Coleman, Beth Eisenberg, Erin Fleming, Gina Gennari, Sheila Master, Melissa Mongi, and Sam Scavuzzo. House of Solitude is the sketch comedy duo of Daniel Corkery and Caitlin Weigel. 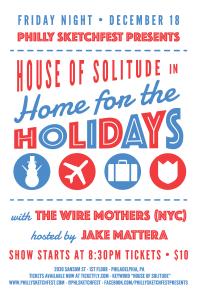 Based out of Philadelhpia, PA their latest show, ‘Home for the Holidays’ is all about the worst part of the season – traveling. Joining the duo is Frank Farrell (The Prince), Maggy Keegan and Joe Moore (Dog Mountain). ‘Home for the Holidays’ is directed by Flat Earth alumni, Sean Landis. Opening the show, from New York City, Broadway musical influenced, The Wire Mothers with their show, ‘The Mel Buttermench Memorial Concert’! From the creators of ManiPedi, Madonna Refugia (The Special Without Brett Davis) and Briana Kelly portray off, off, off-Broadway chorus girls, Diane Nowandlater and Carol Guddenplente who finally get their chance in the spotlight as they pay tribute to one of the worst composers of all time, Mel Buttermench (Rob Baniewicz). Directed by Michael Wolf (NANCY, OSFUG), The Wire Mothers performed this show to a sold out audience at the Montreal Sketch Comedy Festival in 2015. 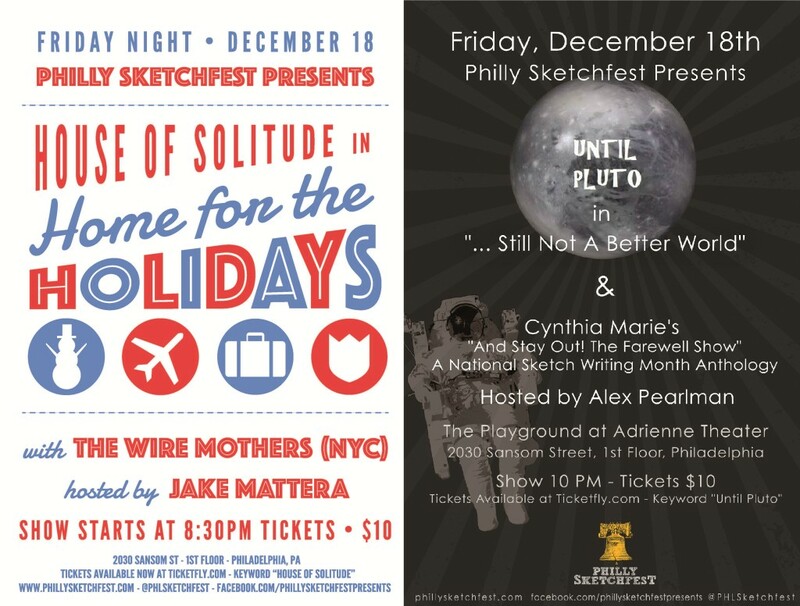 This entire one-night only sketch event is hosted by stand-up comedian, Jake Mattera. Straight out of the 2015 Black Friday Comedy Marathon and into PHIT’s sketch night, ‘Locked in Julia’s Basement’ is the creation of comedian, Julia Celley. Surreal, bizarre, and opening the show for stand-up Tim Raymus, ‘Locked in Julia’s Basement’ features performances from Sarah Carter, Chris Gory, Trevor Miles, Andrew Nealis and ‘Julia’ herself, Julia Celley. 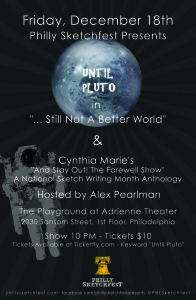 Until Pluto is a sketch comedy group created by Patric Ciervo (Patric Writes Sketches) and Peter Gerbron. ‘…Still Not A Better World’ is an historical sketch show that journeys from the 1770’s all the way to the early 2000’s in an effort to determine how far we’ve really come in America. Featuring performances from Gabriella Bottoni, Patric Ciervo, Peter Gerbron, Jimi Haak (Goat Rodeo), Steve Holland (BFTV), Megan Marron, Marcely Jean-Pierre, Samantha Russell (Secret Pants / Goat Rodeo / Youth Large) and Paul Triggiani (Secret Pants / The Flat Earth). Opening the show, Cynthia Marie’s ‘And Stay Out!’ which serves as both an anthology of sketches written during National Sketch Writing Month and a farewell show as Cynthia will be leaving Philadelphia shortly after the New Year. Hosting the show, stand-up comedian Alex Pearlman! Philadelphia’s ONLY Sketch Comedy Open-Mic, Sketch Up or Shut Up, returns to the Philly Improv Theater (PHIT) stage Friday night. Sketch Up or Shut Up was created by Meg Favreau, is hosted by Brian Kelly and is THE place for sketch comedians to work out their new & in-progress material in front of a live audience. Sketch Up or Shut Up is a FREE SHOW and enables sketch comedians of all experience levels try out new material, meet each other and build relationships. Sign-ups begin in the Lobby of the Adrienne Theater at 11:00pm and the show begins on the 2nd Stage at 11:55pm. Not a sketch comedian? That’s fine too! Actors are encouraged to attend & volunteer to be in the sketches of writers who either do not wish to perform their own material or do not have a group of people to work with yet. Not a writer or an actor? Wonderful. Audiences are welcomed and encouraged to join us and simply enjoy the show. Know about an upcoming sketch show? Want us to tell people about it? Send your listing to brian.kelly@phillysketchfest.com.